MV Monday is a little different this week. As the Kpop world takes an understandable hiatus we take a look at an English language group with links to the Kpop world. Electro Pop band IAMMEDIC have returned with their track Get Back Home. You may never have heard of IAMMEDIC but you may have heard of some of their members. Leader Enik Lin is a solo singer from Taiwan; Andre Harris joins him from former endeavour Burning Tree Project; lifelong friend, Danny Park, DJ for 1TYM Danny Im’s Danny From LA and producer of MNET’s Alpha Girls, is also a IAM member; the group is complete with their official DJ Sangyup Jeon, a popular Seoul DJ sponsored by H&M Seoul, otherwise known as DJ YUP. Fans of VanNess Wu and/or AZIATIX may have heard of Enik, he’s even released a song featuring YG’s Lydia Paek. The name IAMMEDIC is a link back to a time of personal struggle for Enik in which he found God and came to believe God is the only healer for the sickness of humanity. IAM comes from the name God refers to Himself as when talking to Moses in Exodus 3:14. MEDIC refers to Enik’s belief that god is the ultimate healer. Aptly IAMMEDIC refer to their fans as Paramedics, the words Paramedic comes from the latin prefix para, meaning at the side of or side by side. Therefore a Paramedic is at the side of a Medic. IAMMEDIC are not however a religious music group, though one might question the presence of uplifting and inspirational lyrics reminiscent of those found in modern Christian music. Get Back Home’s lyrics give the message that you don’t need to run from your problems as you aren’t alone, someone will be able to help you with your troubles. The visuals are somewhat reminiscent of a modernised version of the Grimm Brothers’ tale of Red Riding Hood. We see a woman wearing a maroon scarf covering her head, much like a hood. She runs from an unidentifiable black smoke. I can hear your demons. Just as IAMMEDIC can hear them, we can see them. The smoke takes form, chasing her as she runs. We learn that although a human form her pursuer masquerades as a wolf. When she stops running and faces the wolf, her demons, we see her terrifier unmasked. 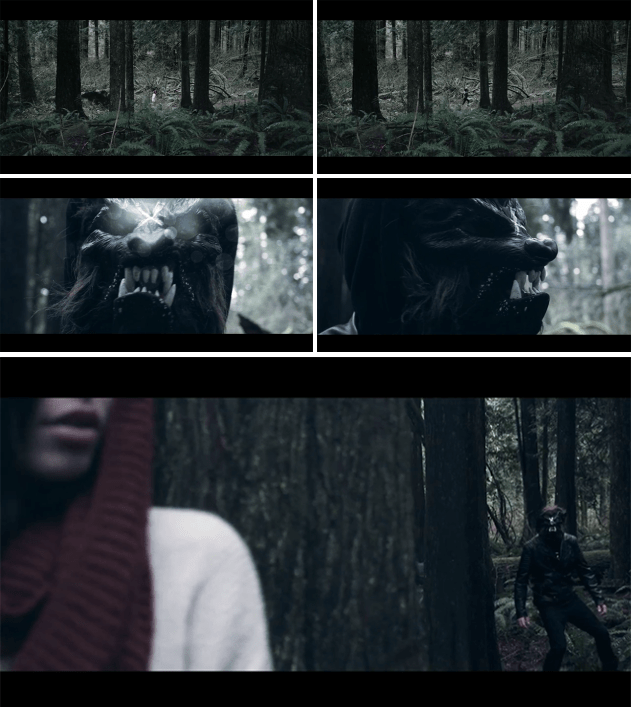 When face to face we find out the wolf is in fact a darker version of her own image. The demons within her have manifested themselves through her own form. Upon facing her reality she is able to banish her demons. Little Red Riding Hood displays themes connected to cycles of nature and life. The wolf represents the dark and the night, whilst Little Red Riding hood is the light of the sun. In the original tale Red is cut out of the wolf’s belly, this is the representation of dawn. In relation to Get Back Home we see the light overcoming the sun to create an alternate path, a new day. Cutting Red from the wolf can also be interpreted as rebirth; the foolish Red who listened to the wolf is reborn a new person. In Get Back Home the scared woman who ran from her demons defeats them, being reborn as a new woman. The mv only shows two IAMMEDIC members, Enik and DJ Yup. Andre and Danny often provide behind the scenes work on releases, such as lyric writing and production. The scenes that include Enik and Yup include common design themes used for IAMMEDIC, such as geometric shapes and purple tones. If you like what you see from IAMMEDIC there are numerous places you can follow them.